One can find sling bags abound in the market in a myriad assortment, made out of different fabrics, lately Jute Bags go stellar and make a strong foothold in national and international markets. It is not like making much ado about the images of jute sling bags, but these bags catch the eyes of buyers at the first glance not because of low price, but account of aesthetics and earthly beauty that makes shoulder bags made out of jute stand into significance among the heaps. Over times, Jute Sling Bags have turned out to be an artistic work of fashion which answers to the prevailing trend as well as illustrate utility. Jute is Geo friendly fiber and recyclable. It is out and out go-green-fabrics which are good to the environment, so jute sling bags stand first in the preference as they are affordable, long lasting, stronger, easily washable, bespoke in color and design in comparison to sling bags made of different fabrics. Jute bags are galore in national and international markets not only in standard but in tailor-made design, size, color in order to suit the individual preference. These jute sling bags can also be further embellished with varied adds-on like beads, sequins, embroidery and printing. 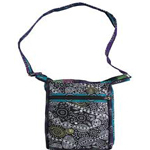 The straps of these bags are very comfy and allows wearing of this shoulder bag easily. Such eco friendly sling bags go well in all seasons whether it be Monsoon, Winter or Summer, owing to their versatile fabrics that are rugged, coarse yet fine and have replaced the bags fabricated from conventional canvas and other materials. Everyone knows that bags made of different inorganic yarns and dyed in chemicals which are detrimental not only to environment but to skin, thus jute sling bags are reckoned to be safest, therefore, are preferred to others.